After an abysmal first date at the Art Gallery of Ontario, "RooBarb" heads home to her second floor townhouse apartment in Toronto's Palmerston neighbourhood and logs onto her online profile to see Lucas' date invitation for the first time. Probably thinking it couldn't be any worse than the evening she'd just spent with "Don Juan," she immediately takes "LuBar" up on his offer. 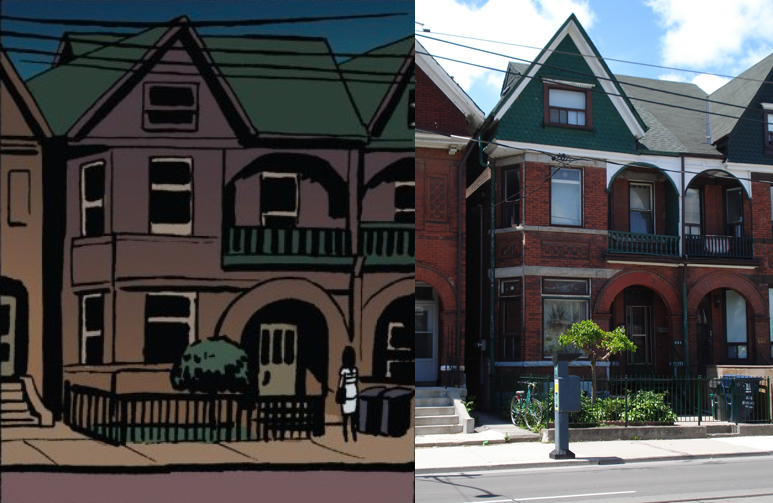 Barb's townhouse apartment at 634 Bathurst Street. Meanwhile, at that moment a few blocks south and west, "LuBar" (a.k.a. 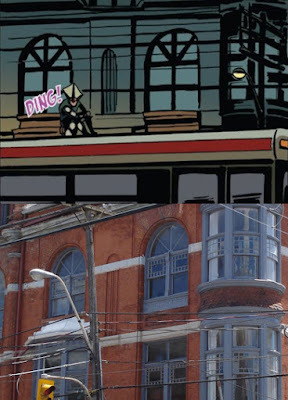 the Human-Lizard) gets her response while riding home on the top of another TTC streetcar as it passes The Great Hall at 1087 Queen Street West. The Human-Lizard zooms past the Great Hall's Drawing Room windows. Built in 1889, and lovingly restored to it's original glory after decades of neglect, The Great Hall is now home to four different venues (The Main Hall, Conversation Room, Longboat Hall, and the Drawing Room) to cater to any kind of upscale event, from concerts and shows to corporate meetings, weddings and even film location shooting. For more information about booking an event, please visit The Great Hall. 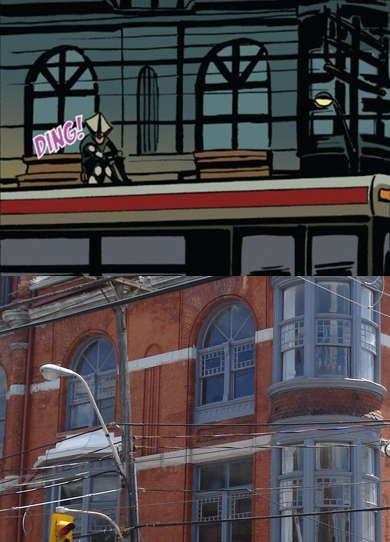 The Great Hall at 1087 Queen St. W.
From 2014 to 2016, the restaurant space in the first floor of The Great Hall was home to the British pub, The Bristol, but has since been replaced by the German themed, Otto's Bierhalle. Up next: The Human-Lizard celebrates the prospect of social interaction while passing by Mr Sub on Queen St. West (now Hot Shawarma/Burger Fighter).